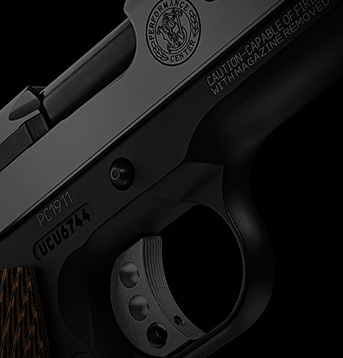 In addition to providing handguns and rifles for competition shooting and protection, Smith & Wesson also offers gun safety tips to ensure proper handling. Safe and secure storage of your firearm is one of your most important responsibilities. It is a full-time responsibility. You must always secure your firearm and ammunition separately so that they are not accessible to children or other unauthorized persons. Whenever your firearm is not in use, keep it unloaded and locked. Your safety and the safety of others requires that you always secure and store your firearm in a manner that will prevent unauthorized access. Never leave a firearm unattended unless it is unloaded, locked and secured. Please review the Safe Storage & Transportation section at the bottom of this page for more information about safe storage practices. Keep your trigger finger outside the guard and off of the trigger until you are ready to fire. Be certain of your target, your line of fire, and what lies beyond your target. Always wear appropriate eye and ear protection when shooting and maintaining your firearm. SAFETY IS YOUR NUMBER ONE RESPONSIBILITY! At home, in the field, at the range, or anywhere, the first concern of every firearm owner should be safety. Before handling any firearm, understand its operation and familiarize yourself with its mechanical features. If you feel uncertain about any operational aspects of your Smith & Wesson firearm, please contact Smith & Wesson at 1-800-331-0852, ext. 2905, before proceeding with its operation. Never allow a firearm to be used by individuals who do not understand its safe operation or who have not read these firearm safety rules. As a firearm owner, you accept a demanding responsibility. How serious you take this responsibility can be the difference between life and death. There is no excuse for careless or abusive handling of your firearm. At all times handle your firearm with intense respect for its power and potential danger. Firearms are dangerous and can cause serious injury or death if they are misused or used inappropriately. Appropriate use of your firearm means using your firearm for legal purposes. For example: target shooting, hunting, and lawful resistance of deadly criminal force. Safety must be the prime consideration of anyone who owns, handles or uses firearms. Accidents are the result of violating the rules of safe firearm handling and common sense. Firearm safety training is available. Contact your firearms dealer, law enforcement agency, local sportsman's club, etc. for availability. Never point a firearm at anyone or anything you do not intend to shoot whether or not it is loaded. This is particularly important when loading, unloading, or field stripping the firearm. ALWAYS control the direction of the firearm. ALWAYS TREAT EVERY FIREARM AS IF IT IS LOADED AND WILL FIRE. Do not take anyone's word that the firearm is unloaded - always check for yourself. Never pass your firearm to another person until the cylinder or action is open and you visually check that it is unloaded. Keep your firearm unloaded and safely stored when not in use. 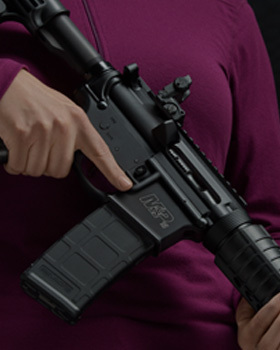 NEVER PLACE YOUR FINGER INSIDE THE TRIGGER GUARD OR ON THE TRIGGER UNLESS YOU INTEND TO FIRE. You should also take care to ensure that other objects do not touch the trigger. Always be sure of where the bullet will strike and shoot only where there is a safe back stop free of obstructions, water or other surfaces which can cause ricochets. Be sure your bullet will stop behind your target. Bullets can glance off many surfaces like rocks or the surface of water and travel in unpredictable directions with considerable velocity. Do not fire randomly into the sky. ALWAYS WEAR EYE AND EAR PROTECTORS SPECIFIED FOR USE WITH FIREARMS. Wear eye protection that is specified for use with firearms every time you handle your firearm for cleaning and maintenance. Wear eye and ear protection specified for use with firearms every time you discharge your firearm. Make sure others in the vicinity of where you will be shooting do so as well. NEVER RELY ON MECHANICAL FEATURES OF THE FIREARM ALONE. Only your safe firearm-handling habits will ensure the safe use of your firearm. This is your responsibility. Always make certain your firearm is unloaded before crossing a fence, climbing a tree, jumping a ditch or negotiating other obstacles. Further, do not use your firearm if you are on any medication which impairs, even slightly, your mental or physical ability. Discharging firearms in poorly ventilated areas, cleaning firearms, or handling ammunition may result in exposure to lead and other substances known to cause birth defects, reproductive harm, and other serious physical injury. Review the warnings and labels for all ammunition and cleaning products carefully. Wash hands thoroughly after exposure. ALWAYS USE THE CORRECT AMMUNITION FOR YOUR PARTICULAR FIREARM. Never use non-standard, reloaded, or "handloaded" ammunition which has not been subjected to internal ballistic pressure testing. Be sure the barrel is clear of obstructions before shooting. Mud, water, snow or other objects may inadvertently lodge in the barrel bore. A small obstruction can cause a dangerous increase in pressure and may damage your firearm and cause injury to yourself and others. BE SURE ALL ACCESSORIES, SUCH AS HOLSTERS. GRIPS, SLINGS, SCOPES AND OTHER ACCESSORIES ARE COMPATIBLE WITH YOUR PARTICULAR FIREARM AND THAT THE ACCESSORIES DO NOT INTERFERE WITH ITS SAFE OPERATION. It is your responsibility to understand and follow all of the instructions in the safety manual that accompanied your firearm, as well as those which may be supplied with your ammunition and any accessory. NEVER DISASSEMBLE YOUR FIREARM BEYOND THE FIELD STRIPPING PROCEDURE OUTLINED IN THE MANUAL THAT ACCOMPANIED YOUR FIREARM. Improper disassembly or reassembly of your firearm may be dangerous and can lead to serious injury or death. NEVER MANIPULATE, ADJUST OR CHANGE ANY OF THE INTERNAL COMPONENTS OF YOUR FIREARM UNLESS SPECIFICALLY INSTRUCTED TO DO SO IN THE MANUAL THAT ACCOMPANIED YOUR FIREARM. If you do otherwise, improper functioning of your firearm may occur and serious injury or death and damage to property may result. Before using your firearm for the first time, it should be cleaned. See the cleaning instructions that accompanied your particular firearm. Your firearm was treated at the factory with either a preservative or oil to protect it against corrosion during shipping and storage. Preservative and oil should be wiped from the bore, chamber and exposed areas using a clean swab or patch before using the firearm. Purchase cleaning supplies from your firearms dealer that are specifically designated for your type and caliber of firearm. Many suppliers offer these in kit form for your convenience. Follow the instructions provided with your cleaning supplies. Whenever your firearm has been exposed to sand, dust, extreme humidity, water or other adverse conditions, it must be cleaned and lubricated. When storing your firearm, do not encase it in anything that will attract or hold moisture, for example, leather or heavy cloth. Also, do not store firearms with a plug inserted in the barrel because this can be a contributing factor to moisture accumulation. If your firearm is to be stored for an extended period, the bore, chamber and internal surfaces should be oiled with a high-quality lubricating oil or preservative intended for firearms. The external parts; receiver, bolt and barrel should be coated with an anti-rust oil. Before using your firearm again, be sure to clean it. Every time you clean your firearm, check it for signs of wear. If wear is noted, do not use the firearm. Return it to the manufacturer for service, or have it checked by a qualified gunsmith. YOU ARE RESPONSIBLE FOR YOUR FIREARM AT ALL TIMES. In owning a firearm, you must undertake full-time responsibility for your firearm's safety and security. You must protect yourself and all others against injury or death from misuse of your firearm 24 hours a day. You must secure firearms safely from children and unauthorized users. Your firearm should always be kept unloaded and locked when not in use. Smith & Wesson provides locks for this purpose with each of its firearms. Please read and follow the instructions packaged with this lock. A lock, when properly used, can be an effective tool in preventing unauthorized access to your firearm. Nevertheless, never assume that the use of the lock provided by Smith & Wesson alone is sufficient to safely secure your firearm. There are other alternative locks and safe storage containers available in the marketplace which may also be appropriate for your particular needs. Consult your local gun shop, hardware store, or local law enforcement agency for guidance on the variety of other safe storage devices or practices which may be appropriate for your particular needs. You must always evaluate your personal situation and employ the security systems that meet your needs to prevent children and unauthorized users from gaining access to your firearm. NEVER LOCK A LOADED FIREARM AND NEVER LOAD A LOCKED FIREARM! NEVER LEAVE THE KEY TO THE LOCK FOR YOUR FIREARM WITH THE STORED FIREARM! ALWAYS STORE YOUR FIREARM AND AMMUNITION SEPARATELY. Firearms and ammunition should be stored separately so that they are not accessible to children or other unauthorized persons. Safe and secure storage of your firearm and ammunition are your responsibility. It is a full-time responsibility. NEVER ASSUME THAT A "HIDING" PLACE IS A SECURE STORAGE METHOD. Others may be aware of your storage location or come upon it by chance. It is your personal responsibility to use common sense when storing your firearm and ammunition and to always make sure they are not accessible to children or other unauthorized persons. When transporting your firearm, be sure it is unloaded and locked. Many jurisdictions have laws that make it a crime to keep a firearm unlocked and in an area accessible to children or others. You must be familiar and comply with all local, state, and federal laws regarding the safe storage and transportation of your firearm. Failure to know and follow the law could lead to criminal charges against you! Obey all laws relating to the storage and transportation of firearms. Consult your local law enforcement agency or firearms dealer for information on storing and/or transporting a firearm safely and legally in your jurisdiction. You are responsible for securing your firearm from theft or misuse by untrained or unqualified individuals.